Players have escaped the modern-day zombie hoard only to find themselves transported back in time and faced with a whole new set of problems! This is a stand-alone game and although based on Zombies is not compatible with it. In MidEvil, point values are assigned to the skeletons (three different colours) and the dead skeletons are used as a commodity. Players use the skeletons to buy weapons and events from their hands instead of having to find them in particular locations. The point system allows ranged weapons such as bows that have a use cost associated with them. In Zombies 4 the players attempted to stop the zombie invasion by getting to the cabin and performing the counter spell. Unfortunately, the spell transports the players back in time and this is the point where MidEvil begins. All in all, MidEvil incorporates some things such as player vs. player combat that the Zombies fans have always wanted. 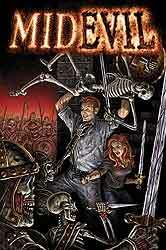 No doubt Zombies fans will figure out how to combine Zombies and MidEvil with their own rules. 30 map tiles, 50 event cards, pawns, rules and 100 skeleton warriors.